Here's the National Aquatics Center in Beijing, which is now almost finished. 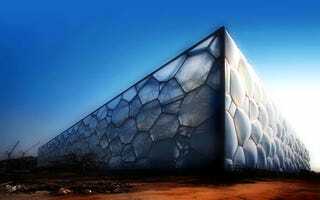 Although the bubbles in this gigantic Water Cube look like they are made of jelly fishes, they really use "two layers of a high-performance plastic film called ethylene tetrafluoroethylene or ETFE." Mmmmmm'kay. So really, what do the jelly fish do? The computer-generated double-layer design leaves an empty space in the middle of each bubble, which is used to warm or cool the building with a very ingenious method: the compressors draw hot air out of the bubbles, warmed by the sun, to heat the interior of the building. When they need to cool it down, the system takes air from the ground floor and out of the building, through exhaust ports on the roof (insert Death Star joke here). This kind of structure is also more resistant to earthquakes, which is a plus in the seismic-rocking Beijing.